Rising high out of the earth from where the dying Buddha donated his begging bowl, the enormous Kesariya Stupa is an enthralling example of how nature can reclaim a deserted monument. Excavated from under a grassy and wooded veil is what is thought to be one of the tallest Buddhist Stupa in the world. The Stupa, dedicated to Lord Buddha has great significance and it is believed to date back to somewhere between 200 AD and 750 AD. This remarkable structure was discovered by the Archaeological Survey of India (ASI) in 1998. Kesariya is located 55 km north-west of Vaishali in the state of Bihar in India. In the time of the Buddha, it was known as Kessaputta. The stupa has an interesting history as well. It is believed to have been built to honor the site where Lord Buddha must have spent the last days of his journey while preparing to attain Nirvana. 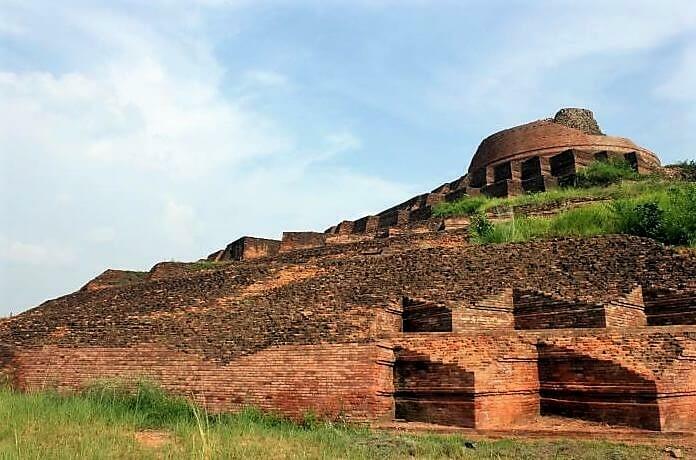 As per legends, the Buddha left Vaishali for Kusinara (Kushinagar) in the last year of His life. As He proceeded on His journey, a large group of Licchivis, who are the people of Vaishali, joined Him and declined to leave. When they reached Kessaputta (Kesariya), the Buddha persuaded them to leave. The crowd was unhappy, so just to cheer them up gave His begging bowl. The stupa is therefore said to have been built by the Licchivis to venerate the end life of Lord Buddha. At first, it was a mud stupa and the Present structure is believed to date back to somewhere between 200 AD and 750 AD. It is said that the monument was built on the remains of an earlier site. This stupa was visited by both Fa-hien as well as Hieun Tsang. Both these Chinese travellers left brief details of their visiting experience to this stupa. Faxian (or Fah sien), a 5th century A.D Chinese Buddhist monk, in his travels, mentioned a stupa which was built over Buddha’s alms bowl by Licchavis of Vaishali. It is now believed the stupa that was referred to in none other than Kesariya stupa. Another important Buddhist monk, Hsuan-tsang, also mentioned the stupa in his travels, but gave no details. The site’s exploration reportedly started in the early 19th century, from its discovery led by Colonel Mackenzie in 1814 to General Cunningham’s proper excavation in 1861-62. It was in 1998 when Archaeological Survey of India (ASI) initiated a systematic excavation, revealing the gigantic structure we see today. The stupa is considered as one of the tallest Buddhist stupas in the world. According to ASI, the original height was 150 feet, however continuous erosion had reduced it to 123 feet. But the devastating earthquake of 1934 which rocked North Bihar further reduced it to 104ft. The stupa competes with that of Borobodur (103 ft) in Java, a world heritage site, of 103-f height. Above the 1400 feet circumference pedestal are five uniquely shaped terraces that form a gargantuan Buddhist tantric mandala. Each terrace has a number of niches containing disfigured Buddha statues, which were destroyed during attacks by Muslim invaders in the Middle Ages. In the 1998 excavation, the place around the stupa was found to house significant items, like Islamic coins, arrow heads, copper and terracotta items, earthen lamps, decorated bricks, some partly destroyed idols, artifacts, and inscriptions, etc. The ASI has declared the stupa a protected monument of national importance. But despite being a popular tourist attraction, Kesariya is yet to be developed and a large part of the stupa still remained under vegetation. There are many things still to be unearthed from the Stupa and the nearby places, which will throw more light on the life and tradition of that age.